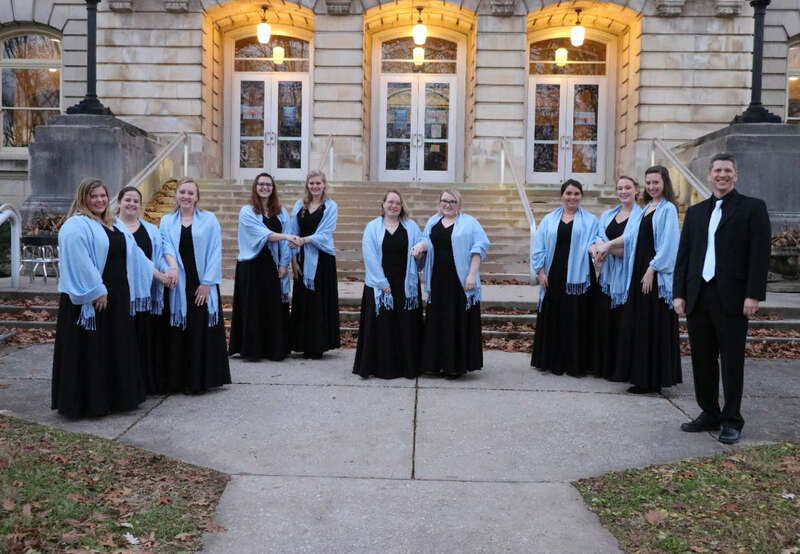 The current members of the SMWC Madrigals and its director, left to right, are Catherine Larson, Valerie Haley, Shea Davis, Karen Muñoz, Abbie Roberts, Allee Taylor, Sara Langenberger, Justine Gibson, Kaci Jones, Kristin Foster and Michael Boswell, associate professor of music. The Saint Mary-of-the-Woods College Madrigals, a select ensemble composed of 10 of the College’s most talented voices, will compete in its first international choir competition at the 2019 Mayo International Choral Festival in Mayo, Ireland in the spring. Elite singers from across the globe will join the Madrigals on stage in Mayo for a five-day music festival and choir competition that spans across the western region of Ireland. The event takes the form of several competing and non-competing choirs participating in a series of concerts, mini-performances and events. While the SMWC Madrigals have performed internationally in the past, the competition aspect is new for the group and will challenge them to rise to the next level as they perform for a jury of international choral professionals. “Choirs will sing for and with each other in a festival setting, which should make for a very supportive and encouraging environment. This suits the Madrigals well, as this matches our philosophy of making music; it’s something to be made for and with others,” said Michael Boswell, associate professor of music at SMWC and director of the Madrigals. Boswell says the student performers are excited and are working very hard to select and perfect their competition pieces. He adds that the final selection of songs will contrast each other and showcase the Madrigals’ unique, blended sound through a variety of styles. “Over the past few years, the Madrigals have shown continuous improvement. I recall a turning point during a rehearsal a few years ago where they completely understood how to sing out while listening to each other for blend. They truly found their sound in that moment and have been moving forward ever since. There are very few collegiate women’s choirs of their size that can make that kind of sound,” said Boswell. This year marks the 60th anniversary of the Madrigals. The ensemble celebrated this milestone over the summer by touring Ireland and performing in Kinsale, Killarney and Dublin. As the birthplace of the mother of the founder of the Madrigals, Marie Brendan Harvey, SP, a 1951 graduate of SMWC, Ireland is a special place for the Madrigals and a natural location for their first international competition. “We will be returning to a part of Ireland that we toured last year, where we found the people to be extremely friendly, welcoming and kind. Their appreciation of our music and generosity of spirit made this a very meaningful place to sing for us and we look forward to reliving that,” said Boswell. In addition to the tour, the Madrigals celebrated the 60th anniversary by releasing a CD, “Lineage: Madrigals at Sixty.” Boswell says the 16-track album features something for everyone with a mixture of sacred music, early American hymns and contemporary music, even featuring songs from The Wailin’ Jennys and Dolly Parton. The songs selected demonstrate the ensemble’s musical evolution, while the CD’s artwork beautifully chronicles the group’s 60-year history. Proceeds from the CD will fund the Madrigals’ trip for the upcoming competition. It will be available for purchase at performances held throughout the year or by contacting Michael Boswell at mboswell@smwc.edu. 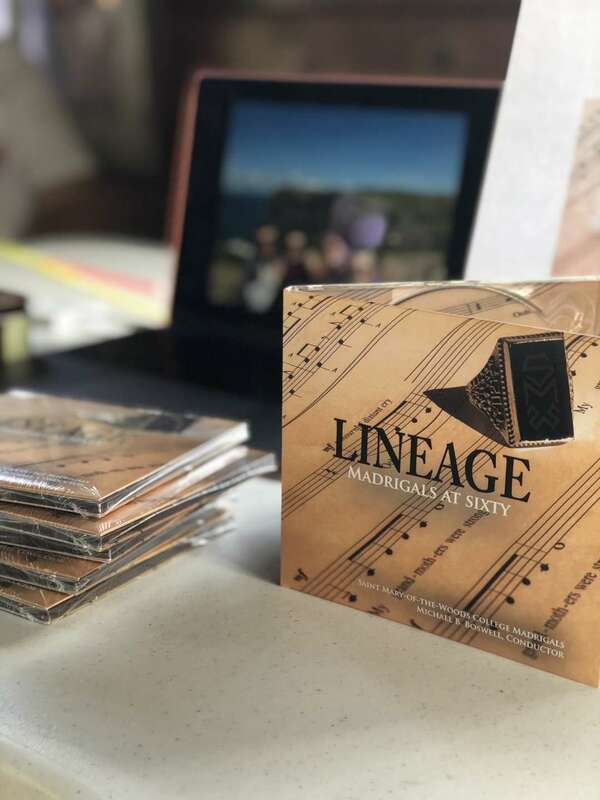 The CD “Lineage: Madrigals at Sixty.” is rich and varied and simply beautiful. Just like the Madrigals in live performance, but without the joy of watching them make such inspired music. Just close your eyes and listen!